Patrick has been potting since he attended Art School back in the 1970s. 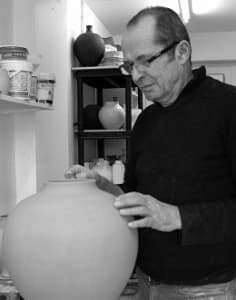 Besides working for a while in a pottery in Lancashire and also as a technician and teacher in a pottery educational department, he has had various studios selling his work mainly art and craft fairs and also through his workshop at Wimbledon art studios. Patrick has been involved in most aspects of craft pottery from throwing on the potters wheel to hand building techniques, like coiling, and the construction of kilns and other pottery equipment. 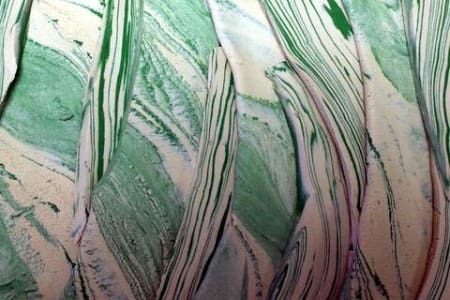 He also has a broad knowledge of the different decorating techniques used in pottery. 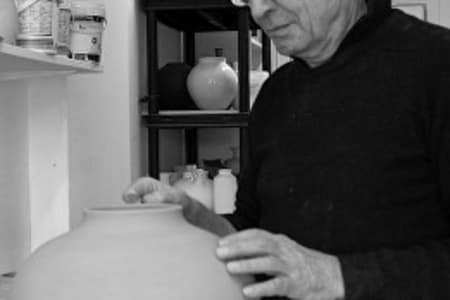 The classes take place in his studio at Wimbledon Art Studios which is well equipped with two pottery wheels and all other tools for the making of pots plus coloured glazes and other types of finish. The classes are small so plenty of attention is given to students with at least one finished pot guaranteed and ready for firing in the kiln. A process that usually takes two-three weeks. Patrick is enthusiastic about teaching pottery and help students to feel relaxed about working with a material that might be a totally new experience for them. Patrick was such an amazing instructor – giving us all the necessary basic skills to start us on our pottery journey: in our case introducing us to the wheel and training us to making our first pots on our own. Patrick is clearly a highly skilled potter and is enthusiastic to share his knowledge. The studio was perfectly kitted out for the session, with examples of work displayed, all tools available and great quality clay. I would highly recommend Patrick’s course for all – from explorer to experts. My husband and I really enjoyed this workshop. It was just the two of us and Patrick was so thorough in teaching us and making sure we were able to make some beautiful pots. We would thoroughly recommend it! Patrick gave us a good opportunity to familiarise ourselves with the potter's wheel. It wasn't just a class to play around with clay, but was jam-packed with life lessons, funny anecdotes and insightful knowledge on the history of pottery and the materials involved. Patrick was incredibly friendly and great company. Really enjoyed this class which I booked as a Birthday present for my girlfriend and I. We were shown each stage in detail and nothing was rushed, so we could relax and actually make some really nice pieces! Nice bright studio, would be interested in some of the other classes here. Very excited to pick the pots up in a few weeks! I had a fantastic experience with Patrick, who is an excellent teacher. The small class size (only one or two people) makes it a much more personalised experience, as Patrick talks you through the whole process, which was great for a total novice like me. I would highly recommend this experience! Patrick was an excellent teacher and made sure we had plenty of time to work with the clay on the wheel. Our pots came out really well in the end. Great fun and highly reccomended! Patrick is a great teacher for an introductory course on the wheel. A small intimate class seemed to be the right choice, as we got his full attention. Had a good laugh, thank you Patrick!! Great class with Paddy in his charming studio. My 11 year old and I really enjoyed it. Came out very happy with what we had accomplished. The two of us had a fantastic afternoon learning the basics of using the Potters' Wheel with Patrick. Booked the class to try something different and we had an excellent time. We're beginners but Patrick was extremely knowledgable and a great teacher so wouldn't hesitate to recommend to more serious potters. Humour clearly suitable for potters of all abilities. Make a Colourful Porcelain Dish by the techniques of coiling and using a mould to shape the dish.